For many years, Pulliam Morris was located on fashionable Devine Street in a sprawling old house — so sprawling, in fact, we spilled over into the house next door. In 2010 we made the decision to renovate an old warehouse in the more eclectic Five Points. It was a move that afforded us the opportunity to customize the space to better meet our needs. Light filled offices for each design team line the central hallway, located just across from extensive Pulliam Morris libraries. 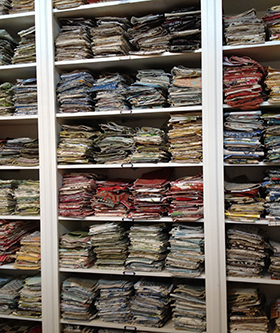 A veritable treasure trove of fabric swatches, flooring, wallpaper samples and more, the libraries not only offer thousands of options, they afford our clients the opportunity to experience their selections — seeing, touching, comparing — as they participate in the creation of their project. While many interior design firms offer the talents of one or two people, we are a company of 14. In addition to five designers, our staff includes four assistants and a host of installers who have been a part of the Pulliam Morris family for decades. When it comes to installing furniture, hanging draperies, blinds, art — these are professionals who know what they are doing. This extensive team, along with an 8,000 square foot warehouse, allows us to offer our clients a broad range of services, from consultation only to full-scale installation. Our design team is experienced in residential, commercial, healthcare and hospitality, and we are pleased to be recognized as one of the Southeast’s preferred historic preservation interior design firms.